ALONGSIDE A FJORD on the journey from Bergen to Oslo. The first sixty-seven miles of the line, as far as Voss, are carried mainly on a shelf blasted out from the rock at the side of the water. IT is by way of Bergen that the most dramatic approach is made to Norway. To the tourist travelling across the North Sea from Newcastle-on-Tyne, the skaergaard, or fringe of islands that protects the whole length of the western coast of Norway, comes first into sight. A conical hill called Siggen, on the island of Bömlo, is the landfall of the present-day mariner on this course, just as it was centuries ago for the fierce warriors in the dreaded Norse longships. Passing in behind the fringe, he sees, opening up between serried ranks of mountains, the yawning mouth of the Hardangerfjord, backed by the great ice-field of the Folgefonn. Leaving this on the right, his ship is shortly afterwards at rest in the busy harbour of Bergen. Bergen might be termed the “Clapham Junction” of the coastal shipping routes of Norway. Owing to the extraordinary configuration of this country - 1,100 miles in length from Cape Lindesnes in the south to the Finnish border in the north, and yet at one point no more than thirty miles in width, with more than half its area elevated at over 2,000 ft above sea-level - most of the towns scattered up and down the coast can be reached only by water. Apart from the capital city of Oslo, in Eastern Norway, the country possesses three towns sufficiently large to be called cities. From north to south they are Trondhjem, Bergen, and Stavanger. Trondhjem was the first to be connected with Oslo by rail, and this route gave the least difficulty, from the engineering point of view. Bergen came next, though in this instance the difficulties were so great that railway communication was not completed until 1909. Stavanger has not yet been linked up. South-eastwards from Stavanger a line is in existence as far as Flekkefjord; westwards from Oslo the network of the Norwegian State Railways extends to Kragero; but there is still a considerable gap between these two extremes. Work is in progress, at the time of writing, on the Sörland Railway, which will first link up the Kragero line with the large town of Kristiansand, in the extreme south of Norway, and will then be extended further westwards to join the Stavanger-Flekkefjord line. Until the Sörland Railway is open, however, the line connecting Bergen with Oslo easily holds the supremacy in Norway, both for scenic attraction and for its engineering achievements. As far back as 1874 the first section of the line was opened, penetrating inwards from the coast as far as Vossevangen, or Voss, as it is known for short, sixty-seven miles away. For twenty-six years this remained the railhead, owing to the forbidding difficulty of the task lying before any engineer bold enough to attempt the laying of a steel highway through the lofty mountain barrier separating Westland from Eastland. 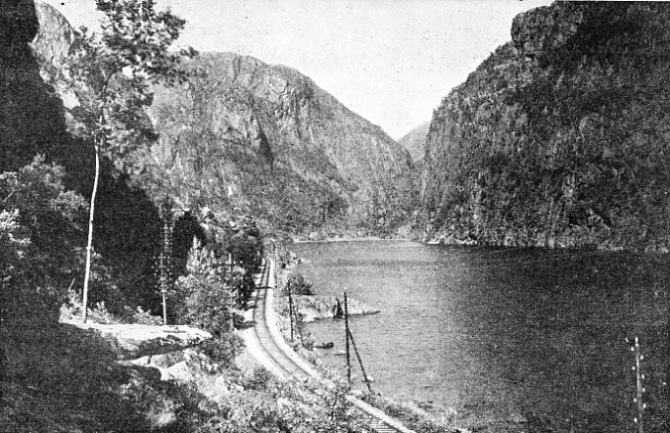 As far as Voss the railway is carried for the most part along the shores of Sorfjord and a branch of this lengthy waterway known as Bolstadfjord. On a ledge blasted out from the precipitous fjord-side the track has been laid, with fifty-two tunnels piercing projecting spurs, and an inland deviation, involving a steep climb up from both directions to Dale, to cut off the corner between Sorfjord and Bolstadfjord. Shortly after leaving Bergen the line passes Troldhaugen, the house of Edvard Grieg, whose music has immortalized the romanticism of this lovely land. PROTECTION FROM SNOW on the Bergen-Oslo Railway, near the Reinunga Tunnel. Tunnel mouths are extended in the form of timber snow-sheds, and further protection is given by snow-fences, such as the one in the foreground. At Voss the railway lies midway between two of the best known fjords in Norway - Sognefjord to the north and Hardangerfjord to the south. Northwards a main road leads the tourist to the hotel at Stalheim, and then down the extraordinary cleft known as the Stalheimskleiva to Gudvangen, at the head of Naerofjord, a branch of Sognefjord, and most profound of all the the fjord chasms of Norway. But to the south the road has been replaced by an electric railway, opened in 1934, which carries the traveller down through magnificent scenery for sixteen miles to Eide, on the most beautiful stretch of the Hardanger. On leaving Voss by the main line, we find that steep climbing begins at once. 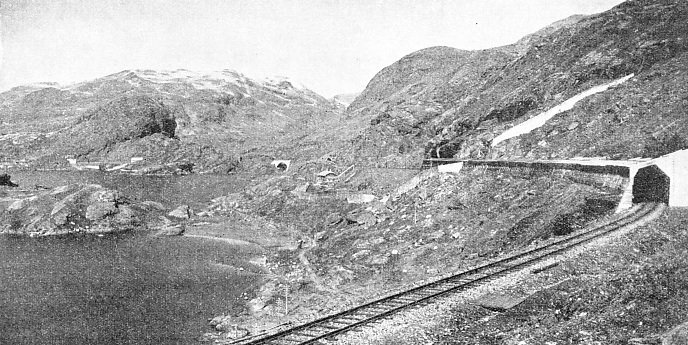 Eight-coupled locomotives, mostly of the 2-8-0 type, are used for almost all the trains, with very small driving wheels in order that the tractive effort may be sufficiently high; and if the train is at all heavy, the probability is that two of them will be required from Bergen as far as Finse, in view of the steepness of the gradient. For many miles this is to continue at 21·7 per cent, which works out at 1 in 46. Voss is only 187 ft above sea-level, and in the next thirty-eight and a half miles, to Hallingskeid, the line rises to 110 less than 4,270 ft above the sea. Herein lay one of the two principal engineering difficulties. In Switzerland the average snow-line, throughout the year, may be taken at about seven thousand feet up, but in Norway, between the sixtieth and sixty-first degree of latitude, the average snow-line is at about three thousand feet. The line therefore rises to more than a thousand feet above this figure, passing on its way lakes which, in a cold season, may remain frozen until well into the summer, and within reach of the ice-falls of great glaciers. Another serious difficulty, especially in tunnelling through these mountains of Norway - some of the oldest in the world - was the exceptional hardness of the rock, in which gneiss, granite, and crystalline schists predominate. A very short time after leaving Voss the railway is well above the tree-line, winding its way up through mountain scenery which, though barren, has its own special attraction. Sixty per cent of the surface of Norway consists of bare mountains, snow and ice; although it is only fair to add that, by reason of the kindly ministrations of the Gulf Stream, the western coast of Norway has a mean annual temperature of forty-five degrees, and it is possible to find prolific fruit orchards in the Hardanger region, tomato plants growing in the open at Bergen, and a flourishing tobacco-growing industry on Sognefjord. As the line mounts higher and higher, snowsheds begin to appear. The traveller who desires to take in every detail of this wonderful journey grows progressively more resentful as snow-shed succeeds snowshed with ever-increasing rapidity, cutting off his view. Except for provision such as this, costly to build and costly to maintain, it would be impossible to keep the Bergen-Oslo Railway open throughout the winter, owing to the obstruction of the line by deep drifts. A SNOW CUTTING is being threaded by an express on the Oslo-Bergen Railway. A rotary snow-plough has been used for this purpose, and the train engine also carries a V-shaped plough in front of the buffer-beam. Toiling upwards, we find the long rampart of the Urhovde Mountains athwart the track, and just beyond Upsete Station there is seen the entrance to the great Gravehals Tunnel. Longest of all the tunnels in Norway, it is 17,413 ft - three and one-third miles - from portal to portal, and is the most monumental achievement on the line. The mountain range is practically solid granite, and progress was very slow. Pneumatic drills of the type which had been used for boring the Simplon Tunnel were brought into use, and with them a detachment of experienced Italian navvies; but the Norwegian granite proved to be harder than the Alpine, also the climate was more than the Southerners were able to endure. They had to be sent home. Furthermore, this was but one of 183 tunnels on the route. In carrying out the work, another formidable difficulty was the fact that no roads existed through this wild country. 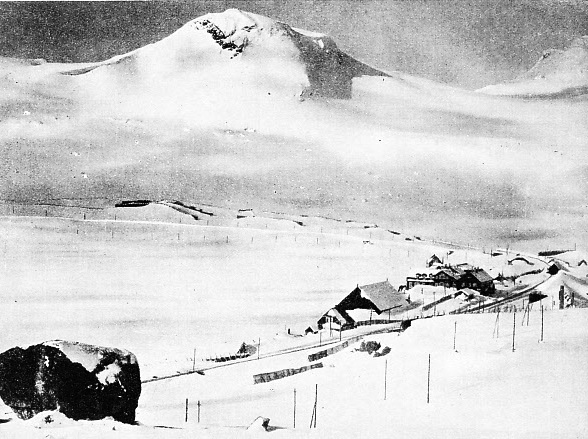 Owing to the climate, there were only three months in each year during which work could proceed in the open, and in some years, such as 1899, when Taugevatn Lake, at the summit of the line, was still solidly frozen by the middle of August, even shorter periods. In the tunnels work continued day and night throughout the winter, and the tunnel workers had to live a life of isolation for seven or eight months at a stretch. Their greatest difficulty in midwinter was that of evacuating the broken rock from the tunnels as it was blasted away. The tunnel mouths were completely closed by great drifts, there were small holes through which the men had to crawl in and out. At the height of the season as many as two thousand men were at work at once, sometimes for as long as fifteen hours at a stretch in the nightless days of the Norwegian summer, of which the best possible advantage had to be taken. From Voss, in the west, across the mountains to Haugastol, to the east, the paymaster, accompanied by a mountain guide, made the journey monthly on skis to pay the workers in their remote encampments. It was a hazardous journey in the winter. Early in 1905 a blizzard overtook the two men, and it was not until six months later, in July, that the bodies were recovered from the crevasse into which they had fallen. During the 1902-1903 winter, the workers were cut off for two months and a half. Stores, including the coal and wood on which their warmth depended, fell to a dangerously low level, but fortunately they did not run out of bread, which it was the custom to bake in their camp ovens. Small wonder it is that the work on the line, begun beyond Voss in 1894, was not completed until 1907. FROM COAST TO COAST the railway network penetrates the mountain barriers. The broken lines indicate routes still under construction. In the summer of 1906 the formation of the line was in a sufficiently forward state for track-laying to begin. On October 7, 1907, the metals from the two directions met near Finse, and in December of that year the line was finally opened. But the work on the snow-sheds and snow fences could not make serious headway until the railway itself was available for the carrying up of the timber, consequently the railway was closed for several months in the winter of 1908, owing to snow-drifts. The summer of 1909, when the snow protection was completed, and continuous operation of the line was thus assured, is generally considered as the opening date. Immediately the train leaves Gravehals Tunnel, and emerges at Myrdal, the traveller faces one of those dramatic scenic sensations which are not revealed to those who merely content themselves with a coastal cruise of Norway. Looking to the south he sees a valley, of no exceptional characteristics, sloping down amid bare mountains to the line. Through the opposite window of his coach, to the north, he sees the same valley dropping sheer for some 1,600 ft into the chasm of the Flaamsdalskleiva. Up from its depths there comes the famous zigzag road, with its twenty-one hairpin bends, still closed to motorcars, and climbed only by the hardy Norwegian mountain ponies, pulling stolkjaerre, or two-wheeled cars. 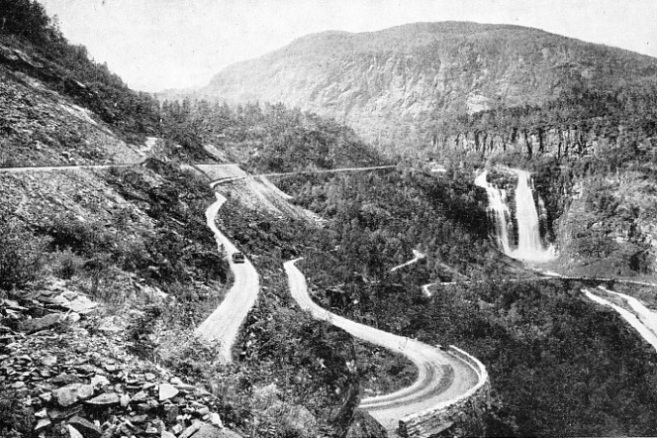 It is one of the roads that were constructed in order to bring tools and materials up from Sognefjord during the time that the railway was being built. Sixteen miles away, down the Flaamsdal, there lies Fretheim, 2,843 ft below the level of Myrdal, on Aurlandsfjord, which is one of the innermost branches of Sognefjord, nearly one hundred miles away from the open sea. A marvel of railway location work is now being carried out down the Flaamsdal. For Myrdal and Fretheim, despite their difference in level of nearly 3,000 ft, are being connected by railway. The first stage of the descent is illustrated in the reproduced plan, and must be one of the most extraordinary railway spirals. Tunnelling is freely employed, with a gradient of 1 in 18, as there are only sixteen miles available to complete the descent. Electric power will be used for working. Directly after leaving Myrdal, the main railway line to Oslo, for a short distance passing between a succession of tunnels, almost overhangs the profound depth of the Flaamsdal. Then it turns inland, and presently, as it skirts Taugevatn Lake, the summit level of 4,270 ft is reached. Along this stretch it is only in the late summer that the immediate surroundings of the line are free from snow. Snow-sheds and snow fences succeed one another thick and fast, and even in summer are a constant reminder of the conditions which must be confronted in the Winter. A MARVEL OF RAILWAY ENGINEERING. 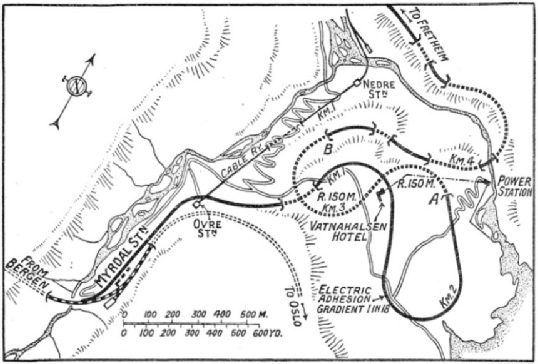 The extraordinary spiralling necessary to overcome the gradient between Myrdal and Fretheim - nearly 3,000 ft - is shown by this plan. It illustrates the first stage of a spectacular descent, which must be completed in sixteen miles. The highest station of importance on the line, which is next reached, is Finse, 4,007 ft above sea-level, and 118 miles from Bergen. Apart from the railway station, with its sheds and shops, the large hotel is the only other building in sight. Above it towers the mountain range of Hallingskarvet, and on the opposite side of the valley is the greenish-blue mass of the Hardanger glacier. Finse is one of the best-known winter-sport resorts in Norway. The climatic conditions are such that in the month of May perfect ski-ing can be combined with days that are almost nightless, owing to its proximity to the Arctic Circle. Falling gradients now lie ahead for a long distance. At Haugastol, 3,240 ft above the sea and seventeen miles farther on, we find ourselves in the middle of the great Hardangervidda, or, more literally, Hardanger “void” or “desert” - a vast plateau 2,500 square miles in extent, and all at or over 3,000 ft in altitude. THE WAY TO THE STATION. 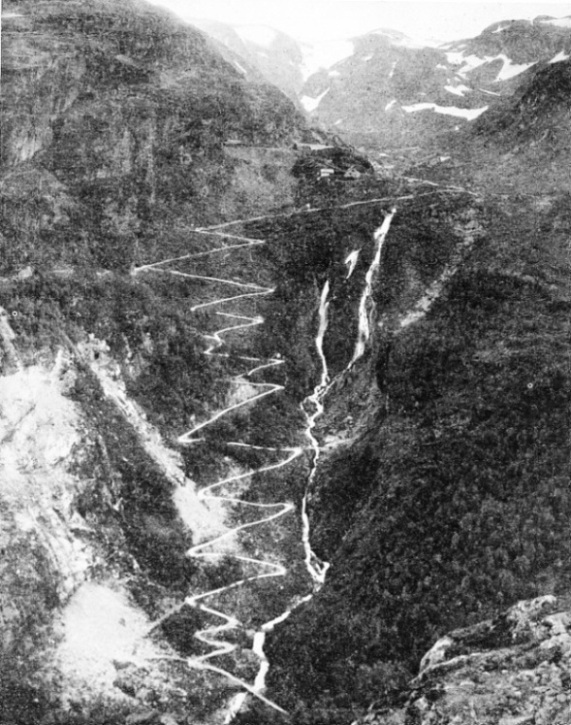 An astonishing zigzag road carries the traveller out of the Flaam Valley to the railway station at Myrdall, on the Bergen-Oslo Railway, seen high up in the background. From here, a line of remarkable characteristics is being built down this valley to Fretheim. Still descending, the railway reaches the first signs of cultivation at Gjeilo, and presently the train arrives at Aal, in the fertile valley known as Hallingdal. Here the line is 164 miles from Bergen, and the level has dropped to 1,432 ft. Aal is an important locomotive depot, being roughly at the midway point on the line, and engines are changed there. Beyond Aal the engineer-ing of the line does not call for any special remark. The remainder of the route lies through the forest lands of Norway, which cover one-fifth of the area of the country, along-side rushing streams, down which the logs are carried into the lakes, where they are collected in great rafts, sorted, measured, classified, and cut for export. A fine scenic stretch of the line is where it climbs along the wooded shores of Lake Kroderen to the Haversting summit tunnel, immediately beyond Orgenvika, penetrating the ridge with a bore 7,580 ft. in length before dropping down again to Honefoss. Another steep climb to Roa, and then comes the final descent into Oslo, 305½ miles from Bergen. The journey is an unforgettable experience, and in the eleven or twelve hours of its duration offers the tourist a kind of cross-section of Norway, which is thus seen in all its varied aspects - fjord, fjell, fonn, joss, and forest, or, in English, sea inlet, mountain, glacier, waterfall, and wood. There is another Norwegian railway which has a good deal to commend it from the standpoint of engineering interest, known as the Rauma Railway, lying considerably to the north of the capital. 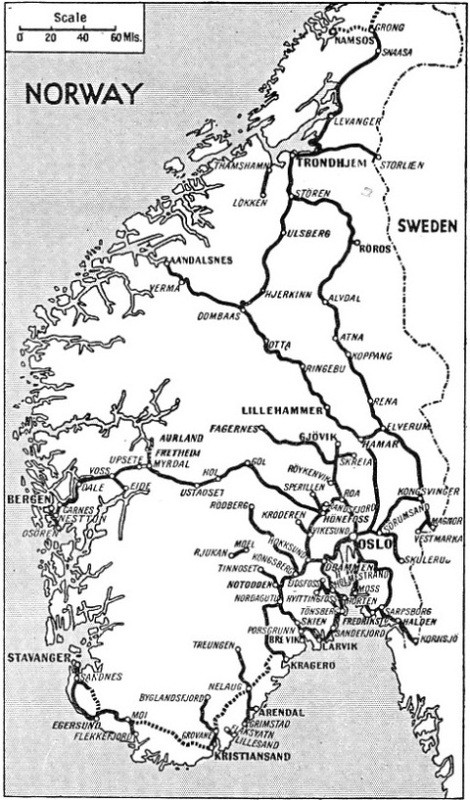 It branches at Dombaas from the main line from Oslo to Trondhjem, and was not opened until 1923. Even the section of the main line from Dombaas on to Trondhjem dates back only to comparatively recent years. Prior to its opening, the route to Trondhjem was farther to the east, by a metre-gauge line - since converted to standard gauge - through Elverum and the bleak mining districts of Roros. Then the main line up the Gudbrandsdal was extended, first to Otta, then to Dombaas, and lastly over the very high ground at Hjerkinn, where the line is 3,360 ft above the sea; here the great mountain mass of Snohetta, 7,615 ft high and the loftiest summit in the Dovrefjell, lies just to the westwards. 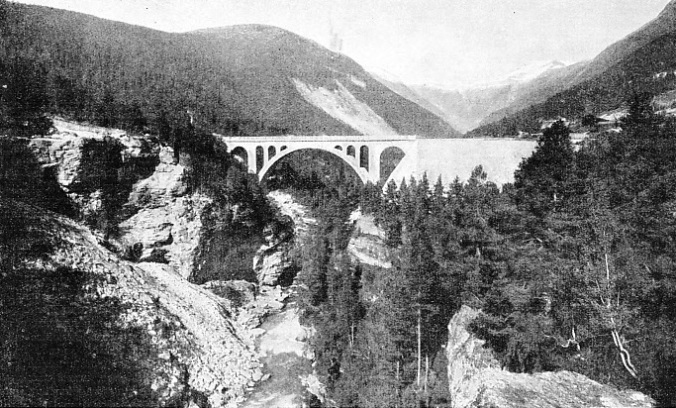 THE NEW LINE from Voss to Eide is shown on the extreme left in this photograph. The track runs beside the road, which is sharply zigzagged, and affords magnificent views of the lovely Skjervet Waterfall, seen to the right on the middle distance. Before the war the decision had been reached to lay a branch from this line, leaving it at Dombaas, down the Rauma Valley to the sea at Aandalsnes. Apart from its value in opening up a district of exceptional scenic attraction to the tourist, an important idea behind its construction was that of affording better access to the capital from the fishing grounds round the large coastal town of Aalesund. The distance from Dombaas to Aandalsnes is only seventy-one miles, but the engineering difficulties were such that the railway cost roughly £2,750,000. It is after the midway station at Bjorli has been passed that the sensational features of the journey are reached. Suddenly the river begins to drop into one of those profound chasms which lead from the rolling hinterland of eastern Norway down to the heads of the fjords. The railway, valiantly trying to follow suit, on a falling gradient of 1 in 50 continuously, is presently left high and dry up on the steep mountainside. IN WINTER DRESS. The highest station of importance on the main east-and-west line, connecting Bergen with Oslo and the eastern ports, is Finse, 4,007 ft above sea-level. At this height there is snow almost all the year round. Finse is a popular centre for winter sports and ski-ing is usually carried on until May. Soon, from the carriage window, across the valley and at a level lower by some 450 ft, the traveller sees what appears to be another line. Before very long his own train will be passing over it. The engineers have here followed their customary expedient, when considerable differences in altitude have to be negotiated in a short distance, without any steepening of the ruling grade; they have doubled the railway back on itself in a gigantic S-bend. The train turns to the left into Stavem Tunnel, which has been bored in semi-corkscrew fashion, completely reversing the direction of the line, so that on emergence, after travelling for 4,146 ft in the mountain flank up a gradient of 1 in 52, it is proceeding south-eastwards instead of north-westwards. Continuing in the wrong direction, the train passes the station at Verma, and then enters the short Kylling Tunnel, 1,444 ft. long, where once again it curves inwards in order to gain space for its great spring across the river. This is made by means of the magnificent Kylling Bridge, built in masonry with a span of 146 ft, and carrying the rails 194 ft above the torrent of the Rauma. This great structure alone cost the equivalent of £40,000. So the railway is carried across to the south side of the Rauma, now resuming its original direction of running, but 450 ft lower in altitude. IN MOUNTAINOUS COUNTRY. Snow-slides from the hills are always a menace, except in summer-time. 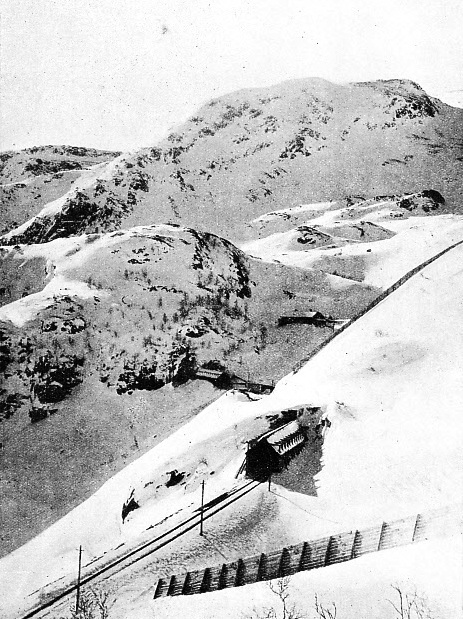 Stout snow-sheds of the type shown here are necessary on the Oslo-Bergen route, where the high ground towers above the line, and the engineers’ difficulties were increased by the frequent bridging and tunnelling necessary in this mountain country. Towering above the line on the south side of the valley are the weird shapes of the Trolltinderne, or “witches’ peaks”, and guarding the entrance to the valley is the fine pyramid of the Romsdalshorn, the nearest approach in shape that Norway can produce to the more famous Matterhorn in Switzerland. So the train reaches Aandalsnes, on the Eisfjord, a holiday centre and halting-place for cruising liners. Apart from the Sorland Railway and the railway from Myrdal to Fretheim, to which reference has already been made, the Norwegian Government is also carrying out railway construction on an extensive scale beyond Trondhjem. North of Trondhjem there is a small junction known as Hell - to which the facetious Englishman, alas! has a fondness for buying a ticket, so that he may display it to his friends on his return home. From Hell a lengthy branch has been opened northwards for 136 miles, first as far as Sunnan between 1902 and 1905, and then onwards to Grong in 1923. Work is proceeding at the time of writing on a further extension which will carry the Nordland Railway, as it is called, still farther northwards to Bodo, a town within the Arctic Circle. Here, again, the fisheries of the Lofoten Islands - where all the major part of the Norwegian cod and herring fishing is carried on - will greatly benefit from being able to put their catches on rail as near to the islands at Bodo, and the transport of the fish to the southwards will be greatly expedited. Still farther to the north, and here, well within the Arctic Circle, lies the port of Narvik, with its great stone quays from which enormous quantities of iron ore are shipped to various parts of Europe. Only a small part of the railway which comes down to the coast at Narvik is within Norwegian territory; the bulk of it is in Sweden. The frontier, at Vassijaure, is 281½ miles away, and is connected with the main Swedish system. It is curious to reflect that on a line like this signal lights and engine headlamps never need to be lighted for a considerable period in the summer, and can never be extinguished for an equal period in the winter. The land of the midnight sun is also the land of the midday night, which is not quite so pleasant. There is one other railway in Norway which deserves a passing mention. The capital of Oslo possesses its own tube railway, which begins in the heart of the city at the National Theatre station, entered by staircases from the busy Karl Johan’s Gade, the main shopping street of Oslo. From here the line tunnels under the Royal Palace and, after passing a station at Valkyrie Place, comes out into the open at Majorsteuen, which was the original terminus. At first the Holmenkol-Tryvands Railway, as it is known, begins steadily to climb, mounting up on to the great hog-backed ridge of Holmenkollen, until it reaches the terminus at Frognersaeter, some 1,500 ft above the sea. In winter the whole of this ridge is deeply covered with snow, and the favourite pastime of the Oslo residents is to take their toboggans with them on the electric cars, to travel up by train to the summit, and then enjoy a glorious coast back down a specially made road into the capital again. Few, if any other, cities can boast the possession of a line which starts as a city tube and finishes as a mountain railway. This quality of uniqueness is not confined to the Oslo tube. The railway in Norway has, as we have seen in this chapter, had to fight for existence against extraordinary odds. KYLLING BRIDGE, on the Rauma Railway, is a beautiful masonry arch of 146 ft span. It carries the rails at a height of nearly 200 ft above the rushing waters of the Rauma River. You can read more on “Denmark’s Modern Transport”, “Sweden’s Rail System” and “Transport in Finland” on this website.